L – R: Chinedu Moghalu, Regional Head, NEXIM Bank, Enugu; Dr.Obiora Madu; Mrs. Gertrude Ukoa, Head, NEPC, Enugu; and Hon. AnayoAgu, SME Centre, Enugu. 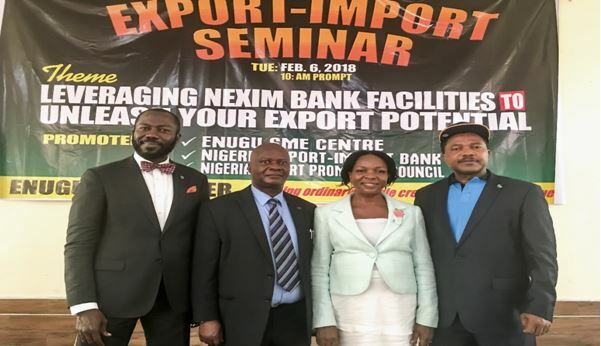 The Nigerian Export-Import Bank (NEXIM) has called on export-oriented Small and Medium Entrepreneurs in the Southeast and Delta States to access the N500 billion Export Stimulation Facility (ESF) and the N50 billion Export Development Fund being managed by the Bank to boost their businesses, create more jobs, and contribute to the foreign exchange revenue earnings of the country. The facilities were made available to NEXIM Bank last December and will lend at a maximum of 9% interest rate. The funds were designed to redress the declining export credit to SMEs and reposition the non-oil sector to increase its contribution to the country’s revenue generation and economic development. The improved export financing for non-oil exporters will enable them to upscale and expand their businesses and improve their competiveness. The objectives of the ESF as contained in the CBN guidelines are to: a) Improve access of exporters to concessionary finance to expand and diversify the non-oil export baskets; b) Attract new investments and encourage re-investments in value-added non-oil exports production and non-traditional exports; c) Shore up non-oil export sector productivity and create more jobs; d) Support export oriented companies to upscale and expand their export operations as well as capabilities; e) Diversify and increase the level of contribution of non-oil exports revenue towards sustainable economic development; and f) Broaden the scope of export financing instruments. Through the Programme, NEXIM Bank will also have a programme for Women/Youth Development, especially to provide support to industries that are involved in Apparel/Garmenting, Cashew, Shea, etc.